With a wedge at last driven between Mat and Dougie Carmichael, courtesy of Nikolai Petrovic’s expert manipulations, the brothers must each accept their new path forward: Dougie, a perfect slave, sweet and obedient and loving. Mat, a tightly reined dog, snarling and snapping but never allowed to bite. Unfortunately, no transformation, however well planned, is without its growing pains. Mat’s leash is so tight it’s choking him. Dougie is tormented by a little voice inside his head—a fragment of his former self—that he cannot silence. And Nikolai’s most difficult tests for the brothers are still to come. The critical question isn’t whether they can pass those tests, but whether they even want to. Without each other to lean on and live for, a bleak future has become bleaker still. But Nikolai’s too good to let his slaves slip through his fingers—by death or by despair. A noose, a nighttime sky, a shared lover, an unexpected friend. A foreboding forest cabin. A lavish party with all the debauchery Nikolai’s clientele could want. 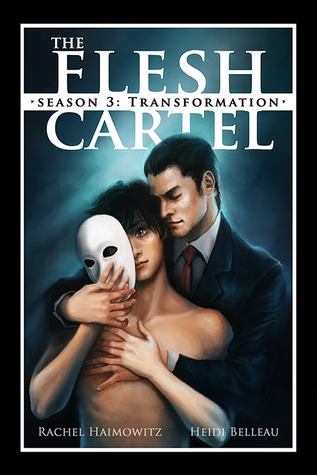 It’s all coming in season 3 of the Flesh Cartel. Worldbuilding: Same spot, Nikolai’s home/training facility setting. In this episode, we get to see more of the staff and get a better feel for the whole operation. Characters: Dougie and Mat evolved more or less in what Nikolai wanted to, meaning they’re beginning their ‘transformation’ process. I’m not sure what happened to cause it, but I felt emotionally detached from them both this time. Roger and Nikolai gave me real emotion either, though they were written as they have been, which is to say well. I can’t really put my finger on it, but I seem to have fallen out of love with these characters for some reason. I’m sure there’s some deep-rooted subconscious reason for it, or I’m just not in the right mindset to enjoy this kind of character/story. Plot: The story evolves as both Dougie and Mat start to more or less play ball (no pun intended, lol). The stages of their evolution are well penned in, they build a clear emotional and psychological trail. Writing: Third person narrative, more than one POV (Dougie and Mat’s, mostly). Curb Appeal: Cool cover & blurb. All in all, I felt this was an interesting addition to the series, but I seem to have fallen out of love with it. I know for sure part of the reason is the serialized format, that kept me in a lukewarm overall enthusiasm about the series. There were parts I loved insanely and parts that were fun, but I think my reaction to this story as a whole would’ve been different had I read it in a complete sort of format. I don’t respond well to serialized stories, by large, which is why I tend to wait for book 2 at least to be out in a series before I start reading book 1. Anyway, this was an interesting development to Mat and Dougie’s stories and I’m curious to know what happens with them in the end. If you’re into this series and slavery stories, do read it, it’s a very interesting series. I’m on #4 with this series and I’m having trouble “caring” about the characters. The original shock value has worn off and I just don’t know if I want to continue the series either. Maybe I’ll get excited over it again, I do keep getting curious to read each new episode.